I love helping home owners sell their homes. Here’s an example I see often – a home owner that has struggled for a long time to sell their property with no luck. In this case the home owners were relocated and living in another province, stuck paying a second mortgage on a home they couldn’t sell. This home in the Spryfield area had been on and off the market for over a year, with two different real estate agents. Marco Di’Qunizio of Press Realty took this listing over and enlisted Staged for Upsell to stage the main rooms, living room, dining room, kitchen, master bedroom and bathrooms. You enter the home in the living room area and it’s a small space, leaving you questioning what furniture you can fit in the room, and wondering if your sofa will even fit. You see, that’s one of the problems with a vacant property – they seem smaller without furniture in them! Too much furniture and they seem small as well, it’s having just enough furniture and the right size furniture that will make the room feel the most spacious. This property had dark red walls in the living room, and a slightly retro kitchen. The home owners actually asked the realtor, Marco if I could stage the property slightly retro in the spirit of the home when they lived there. The reality was, that’s exactly how I saw the property even in it’s vacant state. Contemporary is the best way to go when selling your home, however, you really have to go with the feeling of the home. Bringing contemporary furniture into a home that feels retro only serves to make the home feel even more out of date. You have to embrace the feeling of the home, or things just feel out of place when it’s staged in a different style…good luck selling it then! Seeing that this home was under $200,000 I also knew we were targeting first time home buyers. I brought in a small sectional that fit the space perfectly, and set up a seating area in the adjacent corner. For a coffee table and end table I used pieces that were glass to keep the space open, but slightly retro or mid century modern feeling. Creating interest in the room also took the buyers eyes away from the slightly rough condition of the room, and allowed the buyer to see how much furniture the space could accommodate and how potentially to decorate it without having to paint it right away. The other room that was a concern during the staging consult was the dinning room. We even contemplated which room we would use for the dining room. One was very small and lead out to the deck, the other one a room further back off the kitchen. We chose the smaller one, and I used a small glass table that fit the space to make the room feel larger. The good news is, it went on the market and that night they received an offer! I really do love it when this happens, it’s a great feeling to help sell a property that has become such a burden, financially and emotionally for someone. I have people ask me is house staging actually works. I have great stories like this all the time! There are thousands of condos on the market in most cities. Standing out amongst the competition is important and condo staging is a must! When a condo is vacant there’s a few problems with that. First of all, the condo will appear smaller than it is, there’s nothing in the room to give proper depth perception. Buyers struggle to know if their furniture will fit in the space, or how to arrange it. Buyers also struggle to make an emotional connection. Having too much furniture in a room is also a mistake some sellers make, it will make a room appear smaller. It’s really important to have just the right amount of furniture and to allow for good flow from room to room, and to create conversational areas that are intimate. Using white furniture in this up-scale condo still allowed the view to take center stage and created a beautiful, soft contrast that really made the water pop out in the photos. 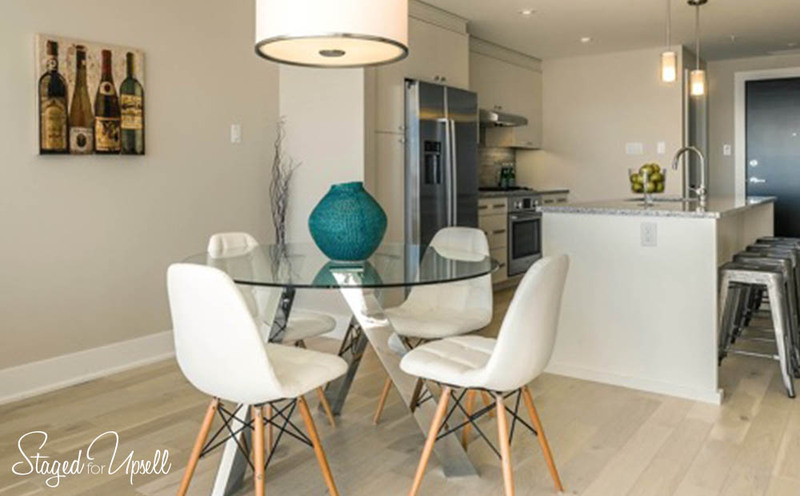 Incorporating natural wood elements in the room, such as the live edge coffee table brings warmth to the condo. I often find that some condos that are staged are quite masculine and sometimes feel a bit cold. This live edge table is always a hit with the men as well – even the rough and tough tradesmen! Using a glass dining table kept the space feeling open, and doesn’t constrict the space…it feels quite large in the photos and in person. The base of the table is chrome adding to the modern feel. Industrial stools were used at the island, and small touches in the kitchen were added. Less is always more when staging – you want clean and uncluttered. I love how this condo turned out, after I staged it I really didn’t want to leave! 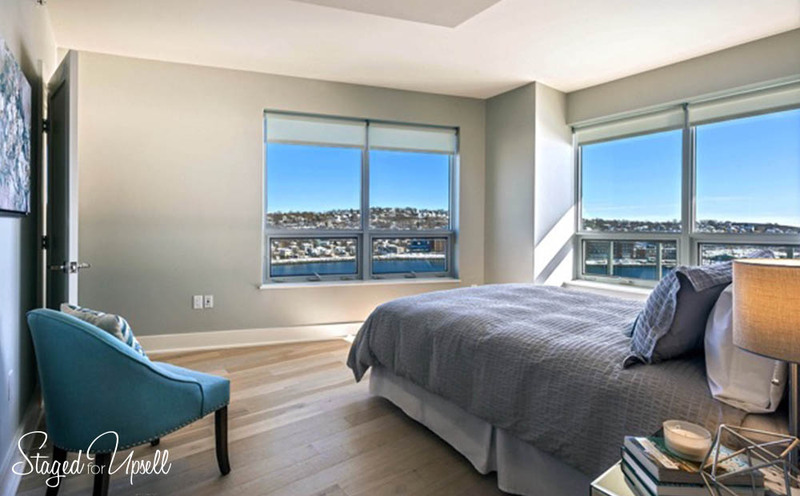 Listed at under $500,000 this up-scale condo in Kings Wharf Aqua Vista building provides luxury condo living at an affordable price. The property initially went on the market un-staged. When Tony Zareski of Century 21 Trident Realty took over the listing he called me in to have it staged. Having worked with Tony in the past he knew the difference staging could make in the presentation of the home. 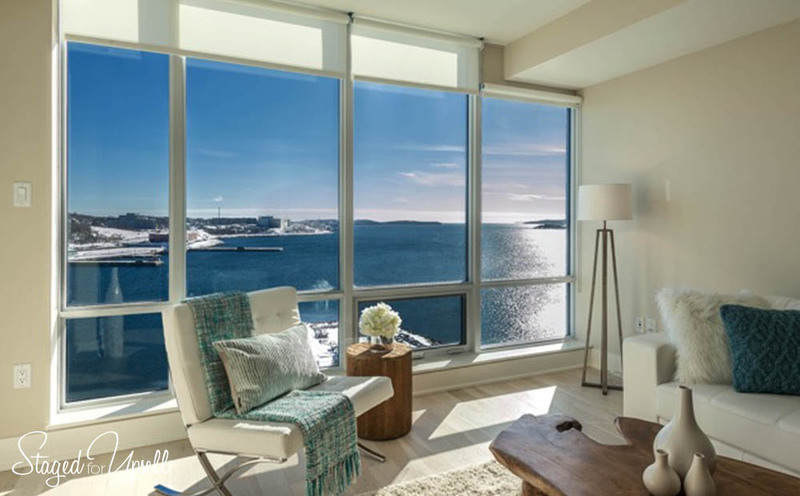 With numerous other condos listed throughout HRM it’s important to stand out! I think you’ll agree that this condo will stand out against others, especially those sitting vacant! Do you have a condo you’re putting on the market? I’d love to help you with all your home staging, or should I say condo staging needs! Photos by Chris J. Dickson, Halifax Digital Imaging. 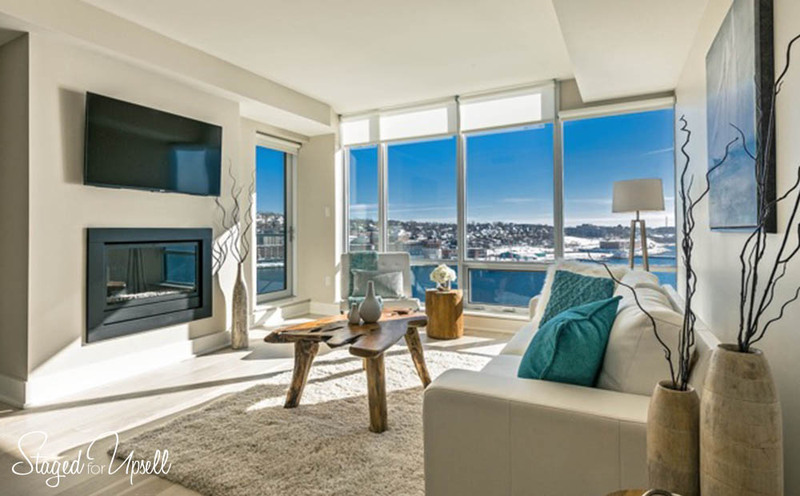 Did you know that Staged for Upsell has Halifax’s largest home staging furniture inventory. We have close to 150 furniture pieces in our inventory, and are always expanding on this inventory. Some house staging companies only offer accessories, but we believe it’s important to offer full home staging services and therefore we’re always investing in our furniture inventory in order to make your home look amazing! Our goal is to always work with what you have and make it look fantastic, however, there are times when a piece or two needs to be swapped out with a piece that’s looking ‘long in the tooth’. Have you already moved into your new home and your old home is vacant? Vacant homes can be very difficult to sell. Rooms without furniture, contrary to what one might think, look smaller, and buyers often have difficulty envisioning how they might arrange or fit their furniture in the space. Even as a home stager I sometimes walk into a vacant home and have to really think about how to place furniture in the home due to the home’s layout. Or I’ve had to ask what the room’s purpose is…”is this the dining room?” If I have a difficult time as a professional home stager, imagine the home buyer’s confusion. It’s important to set up rooms in the way they were intended to be used while your home is for sale. If your children commandeered the family room as a play space? It’s worth it to change it over to a family room or office space for the duration of the listing. The simple truth is that offices and family rooms sell – play rooms don’t. That is unless your home has all that space to offer and then also a play room. We’re Halifax’s largest full service home staging company, servicing Halifax, Dartmouth, Bedford, Hammonds Plains, Timberlea, etc…it’s a long list, I think you get the point. Contact us today to get a quote! You’re thinking of selling, and like everyone, you want top dollar. Staging your home can be the ammunition you need to make your home stand out amongst the competition, and result in higher offers. Top producing realtors understand the importance of a home looking great in order to market it more effectively and to bring in offers quickly. Many realtors that I work with provide a home staging consultation for every listing, as well as suggesting staging to their clients. In the study the majority of realtors that work with sellers were found to utilize staging as a marketing tool in at least some of the instances, with 34% utilizing staging on all homes. Every location and market is different, however, no matter what the market, it’s clear that staging your home for sale can be a factor in selling your home more quickly, and possibly for more. To read more about the study click here. What exactly is staging? Well, it’s more than just decluttering, and cleaning. Staging includes ensuring that each room in your home is being used in a way that is ideal for selling conditions, that furniture layout is optimal for great flow throughout your home, as well as prepping or lightly decorating your home to show well and create a must have. If your home is vacant it’s even more important to stage your home. Vacant homes can be very difficult to sell. When you’re home is vacant, its void of character, rooms look smaller, the home feels “cold”, and I don’t mean temperature wise. There’s also nothing to focus on, so buyers focus on all the imperfections. Even if you’re still living in your home your goal should be to have buyers focusing on the beautiful décor – not the flaws. 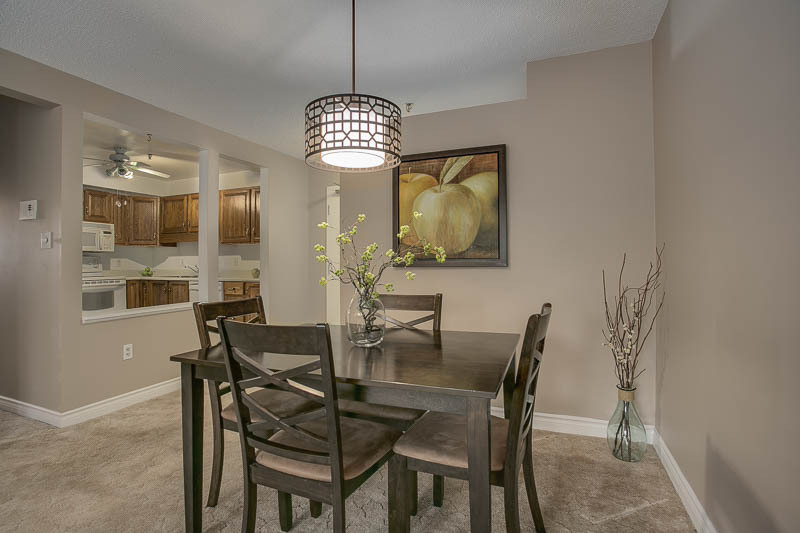 To view a portfolio of my staging click here. 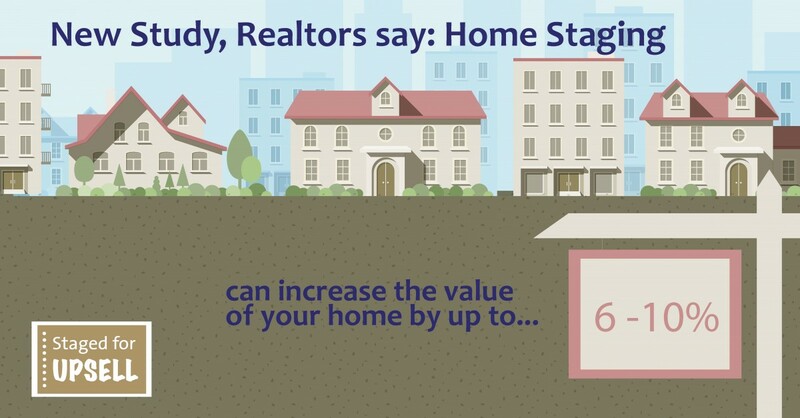 Call me at 902-830-3170, or email me at joanna@stagedforupsell.com today for a consultation to stage your home for sale. I’d love to help you sell quickly and for top dollar! 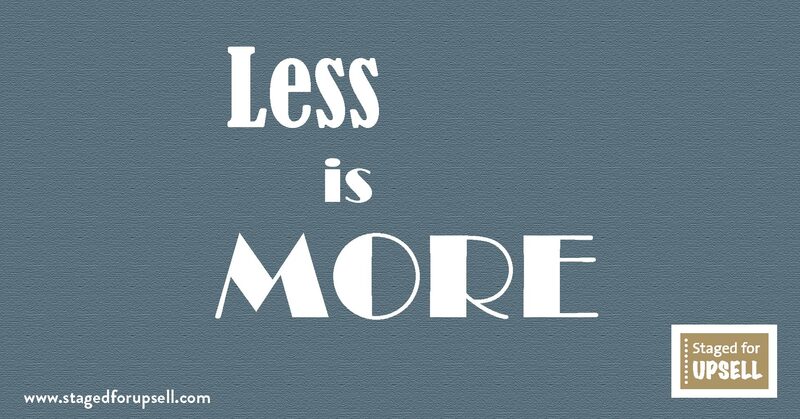 Less is more is a phrase I use often when doing a home staging consultation. When a home is completely vacant besides buyers having a hard time visualizing the true size of the space, or how they would fit their furniture, they also see every flaw. There’s nothing else for them to look at or to distract their eye so they hone in on all the little flaws! On the other hand, if there’s too much clutter or a home is over decorated they don’t know where to look and can’t see past the clutter. If there is too much furniture the space will actually appear smaller. Decorating to live is much different than staging to sell. When your home is on the market it’s important that potential buyers can see themselves living in the house – not you and your family living in the house. That means removing personal items, family photos, collectibles, trophies, etc. Home owners tend to not notice their own homes any more. They’ve looked at everything so long they don’t see what other people see. 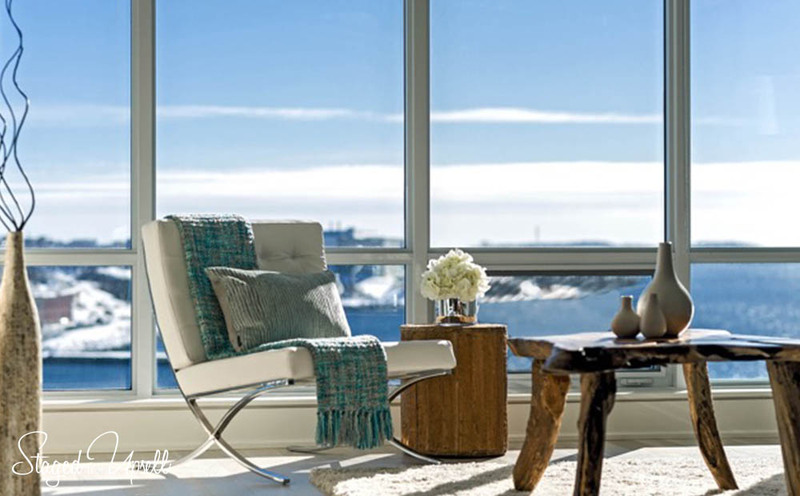 A home stager can look at your home with a fresh pair of eyes and they’re trained to notice everything. Storage areas and closets are important to buyers so make sure you purge these areas as well. Buyers are going to look everywhere in your house so don’t kid yourself that you don’t need to clean and de-clutter your closets. You also need to clean and de-clutter garages and sheds. Every inch of space is valuable when selling your home! If you’re not listing your home for a few months use the time to start de-cluttering and sorting through those closets now rather than waiting until the last minute. You’ll be really glad you did! It will also give you time to sell any unwanted items, that’s always a great bonus. On average a home owner should pack away approximately 30% of their belongings. Using a storage container such as PODS is a great solution for removing excess furniture, personal items and storage from your property. If you do use one make sure you have PODS store it for you off your property while your home is for sale. You don’t want to advertise to potential buyers that you don’t have sufficient storage or space in your home! The other benefit of using a POD container is that you’ve already got some of your packing done for when you move to your new home. You can have PODS deliver the POD container to your new home. All this said, there is a fine line when it comes to staging a home for sale – you want to remove all the clutter, but you also need to add or keep a little bit of decor. For example, I hate when I see a kitchen table without something on it. Add floral or a beautiful decor piece that will accentuate the space, and add decor to a coffee table. Décor also adds softness to a room, a stark room is uninviting and cold. Adding the right décor and artwork to a fireplace mantle and arranging furniture the right way can create a beautiful focal point in the room. It’s knowing what to take away and what to add or leave that makes a space amazing and keeping in mind that less is more. 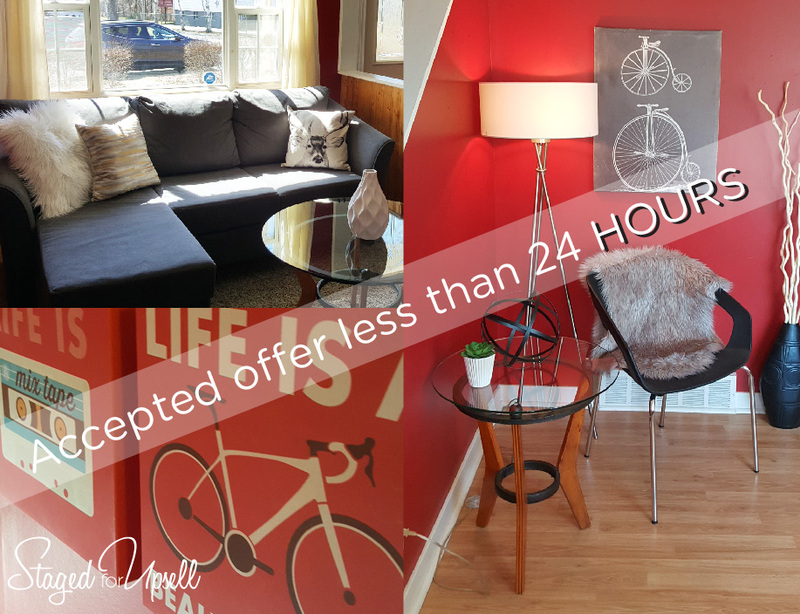 Staging of vacant condo brings in accepted offer in one day! Our client, a realtor had a vacant condo unit in a Dartmouth neighbourhood that she needed to list right away. There was another condo unit in the building that is essentially the same. The other unit was also vacant and had at this point been on the market for over 80 days. The condo unit was a fairly plain unit, carpeted, neutral colours with heavy drapes, and a very outdated chandelier in the dining room. It felt drab, outdated and lifeless. Knowing that staged homes sell for more, and quicker than vacant and unstaged homes Mary knew it needed to be staged so we met to see what we could do to show the property at its best. We needed to bring the space to life, but also keeps costs at a minimal. There was one thing that we knew would be worth the money to update – it was the chandelier! We knew changing it out for more modern lighting would make a significant difference in the look and feel of the space. Lighting is such an affordable upgrade that you should always consider when preparing your home for sale. I found this great light at Kent Building Supplies, they have an amazing selection of lights very reasonably priced. As you can see the lighting makes a significant difference in the space! We also removed the heavy draping from the windows, and left only the sheers to soften the space and make it brighter. We pulled up old pink carpeting that had been laid over linoleum on the bathroom floor. Over and above that, we made no changes other than staging the unit with furniture and décor in the livingroom, dining/kitchen and bathrooms. 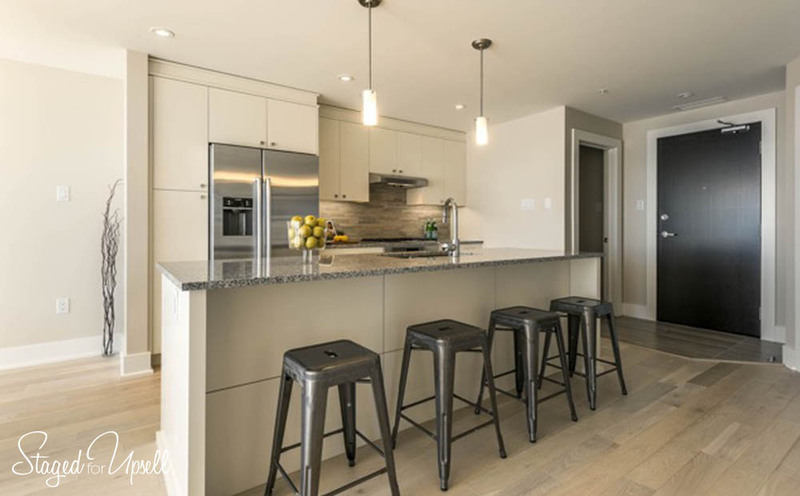 These condo units attracted an older generation so we went with a contemporary style. The sellers only had the condo unit for a short period of time after purchasing it earlier in the year when they decided to put it back on the market. The listing went up and the very first viewing brought in an accepted offer in less than one day of the unit being listed. Mary was able to make a profit for the sellers who had decided to sell after only owning it for three and a half months by selling it for $11,000 more than what they paid for it earlier in the year! Mary moved it quickly and got a great deal for the sellers! Author joannalane01Posted on October 21, 2014 Categories condo staging, Vacant home stagingLeave a comment on Staging of vacant condo brings in accepted offer in one day!